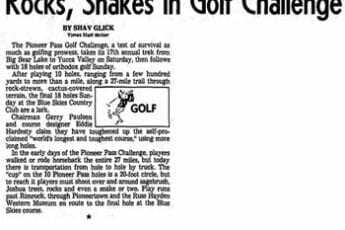 YUCCA VALLEY –For three days starting Oct. 7 the Pioneer Pass Golf Challenge, the only tournament in the world with a 28 mile long 19th hole, Will be playing from Yucca Valley to Big Bear Lake over one of the most scenic mountain desert fairways in Southern California. Golf pros, amateurs, duffers and hackers may play this longest of golf courses. The tournament starts with a kickoff banquet and entertainment in Yucca Valley Thursday night, Oct. 6. Contestants will play 9 holes of regulation golf on the Hi-Desert Golf and Country Club course in Yucca Valley the morning of Oct. 7. 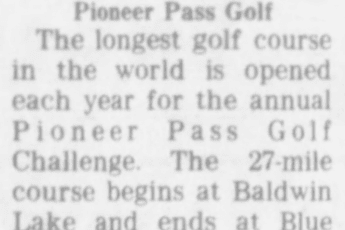 Then, teeing off from Pioneertown, they will proceed to play the 19th hole along Pioneer Pass Road through colorful canyons, pine forests and mountain meadows until they reach the final stretch across Baldwin Lake to hole out on the green in front of the Peter Pan Club. 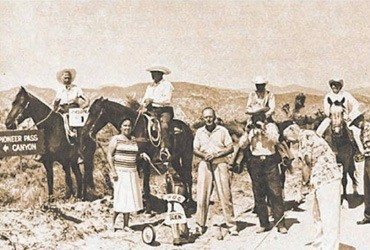 From there nine holes will be playing on the fairways of the Moonridge Golf and Country Club. The climax will be the awarding of trophies and the banquet to be held at the Summit Inn. The challenge is under the auspices of golf equipment manufacturers and local merchants. Entries maybe commercially sponsored Haywood Garlow of Moonrigde Estates maybe contacted by anyone wishing to award a prize or sponsor a contestant.